This interchangeable NTC thermistor temperature sensor provides long-term stability and reliability for high-accuracy temperature sensing, control, and compensation. 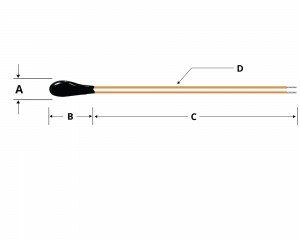 Having one modification that makes it different from the rest of the ACCU-CURVE™ Precision Thermistor series, this model has insulated tinned copper leads, ensuring the most accurate temperature sensing with no unintended conduction between leads. Providing designers with faster, less-expensive alternatives to RTD probes and thermocouples this ACCU-Curve series thermistor delivers the tight tolerances required for temperature measurement in critical medical instrumentation. It can also be potted in a variety of housings for temperature compensation circuits in industrial and automotive applications. 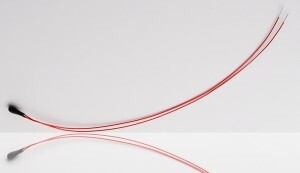 Offering diameters of 0.06 mm and 32 AWG tinned-copper leads, this epoxy-coated thermistor is available at the resistance value of 25°C 50 kΩ, with a dissipation constant of 3 mW/°C, and thermal time constant of 12s. You are on your way to solving your temperature sensing challenges with our quality line of high performing ACCU-Curve Precision Interchangeable NTC thermistor temperature sensors. This device is available direct from Ametherm or through our distributors: Digi-Key and Mouser. Samples and production quantities of the thermistors are available now, with factory lead times of 12 weeks.